Proper prior planning and preparation prevents piss poor performance. This may be true of many things, but apparently proper prior planning angers the caving gods. We thought we were well prepared for this trip, having copied the survey onto laminated paper and packed our ropes the night before. We had an early start, a good breakfast, and virtually no faff at all. Luckily, we were able to avert going underground before lunchtime by taking a detour via the assorted caving shops of Ingleton, where ample time was wasted on purchasing helmets and other paraphernalia (but none whatsoever on parking the minibus). Happy that we were no longer at risk of caving in the morning, we arrived at the pumping station near Marble Steps and Large Pot and set about gearing up. Around this time it emerged that the laminated copies of the surveys were, in fact for the wrong caves. Team Large was saved by Jarv's trusty digital camera, faithfully transcribing several pages of 'Selected Caves' & 'Not for the Faint-Hearted' in mere seconds. Once again, we were satisfied that we were sufficiently prepared and made our way to the entrance. We passed the first pitch without any problems, but encountered no end of excitement upon reaching the second. At this stage, I must hand over to Jarv for a more complete account of the fun he had hanging upside down for 15 minutes, suspended only by his cow tails. By the time I had joined them, Jarv had been rescued, and the only indication that anything had gone wrong was seeing Thara's feet sticking up at a very awkward angle. Deciding that this was a crawl that definitely should not be attempted head first, I crawled back up out of the narrow, uncomfortable squeeze I had just passed with considerable effort to reach a space large enough to turn in. Reaching the second pitch confirmed that turning had been the right choice, and I was able to rig my stop in no time at all. I then proceeded to descend down the wrong hole, got very stuck, cursed, crawled back out and shuffled across to the actual pitch, which was a good inch or so wider. Slowly wriggling down, I heard Jarv confirm that feet first was the way forward, and telling me it was another six feet to the rebelay. Not realising that he could not see me at the time, I went against my better judgement and kept descending. Upon realising that I had gone too far, I ascended a few metres, accompanied by more cursing from myself and worried calls from Jarv beneath and Jutta above. Eventually, I did pass the rebelay and continued my descent. Around this point, I casually glanced at my stop and noticed that it did not look quite right. Not wasting time to figure out what was wrong, I let Jarv know in no uncertain terms that I was not happy with the way things were going, somehow found enough holds to wedge myself against and took a closer look. Some frantic fiddling got the stop into a state that seemed safe enough to continue the descent and, fuelled by a healthy dose of adrenaline, I arrived at the bottom of the pitch. Only then did I realise that it was not my own incompetence that had led to this potential disaster, but rather the fact that ICCCs second ever Petzl stop had reached the end of its useful life and was ready to be retired. Jarv kindly donated his stop for the next pitch, once he had safely reached the bottom himself. Convinced that by now everything that could have gone wrong had gone wrong, we pushed onward, crossing The Pit with ease before splitting into two parties, one led by Jutta (down Secret Seven Passage), one by myself in the erroneous belief that I was following Jutta. Once reunited, we walked, crawled and squeezed on, emitting between us a cacophony of moans, groans, squeals and profanities that had to be heard to believed. Eventually at Calcite Corner, faced with the choice of carrying on down a "muddy crawl, followed by a tight squeeze, followed by more mud" or eating our malt loaf and heading back out, we unanimously voted to not antagonise whatever deity we seemed to have offended and further and cut our losses instead of our remaining cow tails. The return journey went quite smoothly by comparison, and we were back at the second pitch in no time at all. The ascent to the first rebelay posed no problems at all, and while the second half was considerably less pleasant, it was still a walk in the park compared to the anguish on the way down. The only real obstacle I faced were Jutta's feet, as she struggled for several minutes to remove her SRT kit to allow her to pass the final constriction before the exit pitch. It was with some relief that we reached the surface, and enjoyed a nice walk back to the minibus through the howling gale and driving hail. With any luck, the memories of this cave will have faded into nostalgia by the time we next attempt it, allowing us to approach it with naive enthusiasm once again. Oh Large Pot; my temptrous, my fickle Lover. The scene of my worst trip ever 21 months ago, I nevertheless found myself being dragged back to the scene of such muddy depravity. 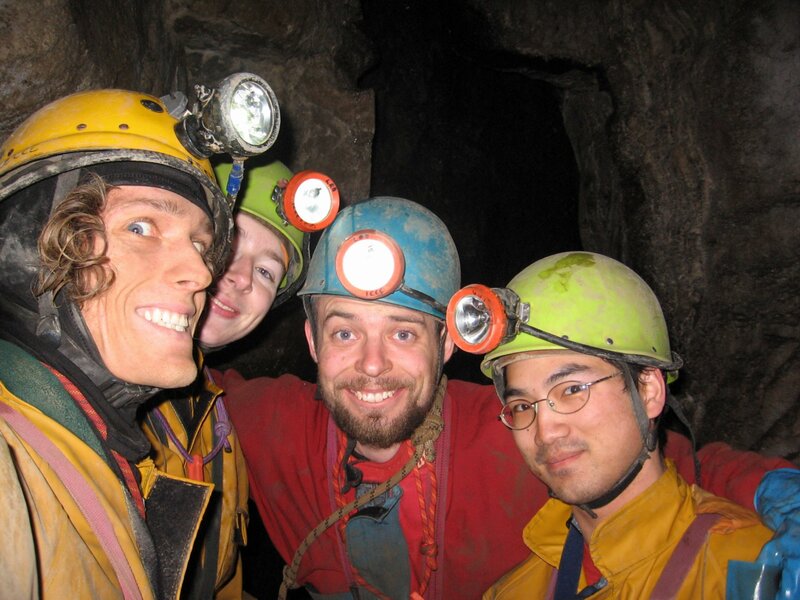 Now 23, an adult for five years, I felt a return was justified, and certainly a good place to train up the now more-than-competent first years to expedition standard caving. The following is a description of My Worst Caving Experience Ever that was the almost immediate result. Whizzed down the first pitch, on into the crawl. Feet first. Can't seem to get round the corner. Ok. Backup, leave tacklesac while considering the rigging and try headfirst. Oh - much easier, ropes all attached. Bit greasy this rift. Clip in at pitch-head to peer down at the first rebelay. Hmm. Try and reverse up the rift, no joy. Not enjoying this; not claustraphobic as such - just not having a whale of a time. Right - lets just go head first through the pitchhead, get weight onto clipped in short cows tail, roll over, pull rope through / rig descender from there. Not panic'ing, but not thinking as carefully as I should. Crawl forward and start lowering down. A pull on my waist... Oh no! I didn't take off my long cows-tail! It's still in the bloody traverse line! Almost fully upside down now. No chance of being able to reach the 'tail. Can't somersault - too confined. Damn. Have to climb back up. No handholds to push off - pitch flares out too much. Looped 9mm rope too stretchy and wiggly to help much. Feel for something with my wellies - nothing to hook around. This is not good. Continue struggling, manage to get a fair few inches up, but never enough to get over the cusp. Hear Thara following. Maybe he can give me a boost? Dangle for a few more minutes as he saunters through the crawl. Right, now he's holding onto my boots, I try and climb but my strength is mostly spent - legs numb with lack of blood, eyes bulging from a surplus. Can't get high enough for him to unhook my cow - too much stretch in the dynamic. Time for the knife action - a few short cuts and I'm free; easily slither forward head down with short cows-tail clipped into rope, drop legs down. Whoah! Head throbs, everything sounds like I'm underwater. A few minutes to let the blood flow and the adrenaline subside, then I head down. Thara, also now trapped in a head-first approach, follows similarly but remembers to transfer his cows-tail while there's still time! It was only when back at the hut that I noticed all the burst capillary's across my forehead, which made me look more than a little like a crack addict. Finding that the rope for Colossus had been left at the top was a relief; the caving wind had been rather effectively knocked out of my sails. And yet, already I'm planning the return. Such abuses at least give this cave a very personal touch and a special place in my heart. No trip report from the participants yet... Apparently Sandeep found himself rather caught out deep down the cave, and filled his survival bag. Not sure how far they got - three pitches maybe? Team Large were dropped off at home by Jarv after waiting for a couple of hours (in order to start cooking), returned to find the Marble Steps boys just walking down from the Pumping Station. Drove them back to the NPC to change. Smooth steady trip straight to the bottom, only marginally upset by Ben B finding that he hadn't a harness, coming over to Marble Steps to search the minibus before bouncing back to the NPC to pick up spare bits of kit. What a lovely little cave! Constricted entrance pitch with exciting traverses and sideways rebelays, culminating at a nice little Y-hang. Bit of a stoop to reach the second, tiny, pitch - then a rather more constricted crawl and sideways shuffle to arrive at the Big One. Once we'd sorted out all the confusion with extra ropes we found an amazing little shaft. Traverse to abseil down over a lip with a deviation, to stand on a pleasent rebelay ledge from which a Y-hang is rigged, deviated after a few metres and then plunged 40-odd metres to the bottom. Extra deviations if its wet; we just went straight from the first. Abseil down past an enormous flake of rock which then suddenly disappears and leaves you in wonderful freefall. Bottles and other diving paraphinalia stashed in the bottom, quite an impressive sump leading off. Thara led the way out, gentle derig from behind. Under three hours to do the whole thing; half changed at the minibus when the Heron Pot faffers returned. We decided to have a nice jolly down Heron pot on the Sunday after the relativley hard trip for those who had only been SRTing once or twice before underground. We waddled over towards the cave entrance in the way that is only possible in full caving kit. Taking a little while to find it we eventually came across the entrance. Quite obvious once you know what it looks like. In, down and around the entrance slide just as the guide book says and then along the crawl. Soon you're at the junction where the stream enters, just keep on going downstream and eventually you'll get out of the crawl. Dragging the tacklesack behind me was the easiest way, just don't be afraid to give it a good kicking to get it moving. We got to the top of the first pitch and I rigged away and the others waited, it wasn't terrible and once I was down the rest followed easily, once they realised the only way through was by going low. Rigging the second pitch was slightly harder, I've never liked heights and it doesn't matter if you're 10m or 70m up if you think you're unstable, this is more often true if you're less than 6'. But after a while we had reached the bottom, scoffed allsorted choclate bits, those cheap tesco orange things are surprisingly nice. I sent the 3 freshers to the crawl and the duck (a slight exageration) while I derigged. Almost done I wasn't sure which way to go at the junction where the stream enters I dropped the tacklesack and crawled further upstream. Meanwhile, everybody else had just got out and wandered to the entrance and not seeing me there, Tom decided to come and pick up the tackle sack (don't I have them trained well?) but he passed me as I crawled up stream only turning around when he saw the first pitch was derigged. We both met up underground at the junction. From this point we were almost out and got back to the bus the just after the aquamole bunch.